Welcome to our Thomas Jefferson website! 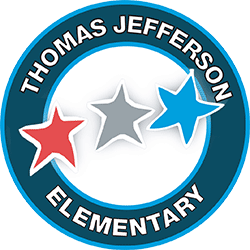 Thomas Jefferson’s staff is honored to serve our neighborhood community by providing a quality transitional kindergarten through fifth-grade program that is grounded in quality first instruction. Since the school’s opening, our staff has strived to be innovative and trendsetters with our teaching. The Thomas Jefferson curriculum is based on the rigorous Common Core State Standards. Our school is committed to the individual needs of our students. We are dedicated to improving student performance, teacher instruction, and the enhancement of knowledge and skills required for working, living, and learning in our ever-changing society. Our students participate in a range of programs including art, music, physical education, media, social-emotional learning, and technology. Each day our students are taught to model character, integrity, and maturity through our PBIS programs as they strive to grow into productive citizens. Thomas Jefferson is a special school with partnerships fostered with parents and the community. It is the norm to see parents volunteering in our classrooms, on campus, and actively participating in their child’s education. We are fortunate to have an amazing PTC, who strive to make Thomas Jefferson and an amazing place to be! Please take time to visit their link on the Thomas Jefferson page to learn more about our PTC and to hear of the fantastic events that the PTC has organized. I encourage you to check our website regularly and become a fan of Thomas Jefferson Facebook page at RCSD Jefferson. We are committed to communicating through a variety of mediums and expanding on the strong foundation Thomas Jefferson was built on. We’re looking forward to a great year working with you and your child at Thomas Jefferson Elementary.